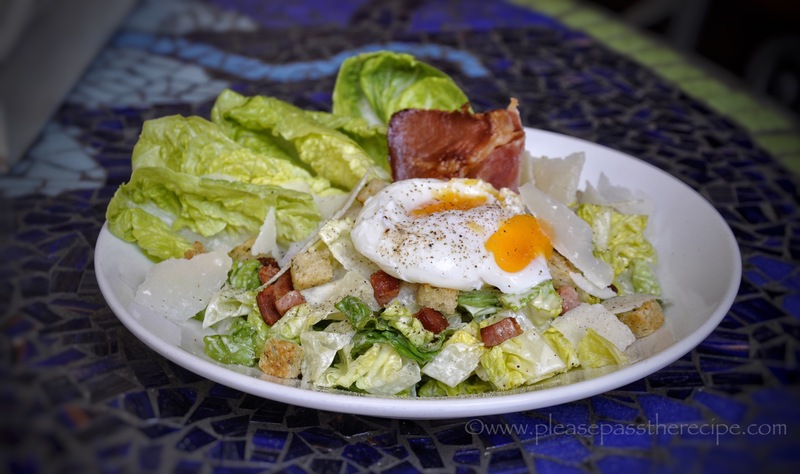 Caesar salad was badly overexposed in Australia in the 1990s. Every city cafe served it’s own unique version often with embellishments that left the salad a shadow of the original 1924 invention by Italo American chef Caesar Cardini. The “make do” salad became popular because of the flourish of table-side theatre associated with it’s preparation and service. Cardini’s salad was made with whole cos lettuce (romaine) leaves, and the diner was expected to pick up the filled leaves at the stalk end. Eating Caesar salad with your fingers never really caught on in Australia, but I can however see a direct link between the Caesar boom and the availability of baby cos in every suburban supermarket. Caesar salad has become a fallback lunch choice when the fridge contents are at a low ebb. It’s rare for me to run out of eggs and parmesan, there’s generally bread and bacon in the freezer and anchovies are a pantry staple. While I really like the flavour of anchovies, I prefer to soften their impact on the salad by including them in the dressing just as Cardini introduced his anchovy flavour by using Worcestershire sauce. The croutons, bacon and cheese are the salad’s seasoning so it’s wise to use them sparingly to avoid the saltiness dominating each mouthfull. Trim the root end from the lettuces and separate the leaves. Put the leaves into a large bowl of cold water and chill for 1/2 – 1 hour. Trim the crusts from the bread and discard. Cut the bread into 1cm dice. Drizzle the parmesan oil over the bread, toss to well combine then spread the cubes of bread on a ovenproof tray. Bake until golden brown then set aside to cool. Dice the bacon, the spread on a baking paper lined ovenproof tray and bake until crisped. Drain on kitchen towel and set aside to cool. Drain the lettuce and thoroughly spin dry. Set aside 8-10 perfect leaves then coarsely shred the remainder. Lightly dress the shredded leaves and set aside. Soft poach the eggs in your preferred method. Divide the dressed lettuce between two shallow serving bowls and garnish with the whole leaves. Scatter over the croutons, bacon and shaved parmesan cheese. Top with a poached eggs and a grinding of fresh black pepper. Serve immediately with extra dressing on the side. Put the egg, anchovies and 1 tablespoon of lemon juice into a deep narrow jug. Incorporate using a stick blender. Continue to run the blender, then slowly drizzle in the olive oil. You will end up with a thick mayonnaise. Thin the dressing with tepid water. Taste and adjust the seasonings with lemon juice and freshly ground black pepper. I just noticed that you’ve a new addition to the family. Congratulations to you and your family! May I ‘like’ too? [From the depths of reading your own just publiished book over this weekend passing far too fast]. My apologies but the love of Caesar Salad in Australia, at least Sydney, was well and truly alive in the 1960s and that from personal experiences 🙂 ! ha, Melbourne must have been lagging behind….!! Thanks John, grandchildren are a special blessing! Thanks Beck, bubs is gorgeous, but then aren’t they all! I think Caesar salad is the most abused cafe food in Australia, sad really because it can be good! Your recipe writing is spot on as per usual. The food history is too. Good one Mrs R.
Beautiful flavours in this iconic salad. I love that you’ve brought us all back to show the original intentions of the chef who first made it. Delicious! Thanks Margot, a good Caesar is hard to beat! You, Madam Sandra, are making me feel extremely hungry. A classic so well executed. Thanks Francesca, we’re having perfect salad weather. Our sweet little grandson finally arrived, I’m in love!! I wondered if he had finally made an appearance. Hooray. And congratulations to all, especially Leah. It is so nice to be in love again. This entry was posted on October 8, 2015 by ladyredspecs in FODMAP diet, Food, Light Savoury Dishes, Salad, Sauces, Side Dishes & Salads and tagged anchovies, bacon, caesar salad, cos, eggs, parmesan, romaine, salad.